The Essex Record Office offers a Search Service for researchers unable to visit the archives in person, and our resident searcher recently came across a fascinating account of a customer’s family history research, and helped to add to her findings, which are shared here with the customer’s permission. Conducting historical research is like attempting a large and complex jigsaw, with fragments of the whole picture to be found scattered around in various family stories and memorabilia and in public collections. We were interested to hear this customer’s story, and are pleased to have been able to add a piece to the puzzle. We were asked to search for the baptism of Thomas Davies, born around 1790 in West Ham. As a young lad Thomas joined the Royal Navy, and was assigned to the HMS Polyphemus. Part of the ship’s business was capturing Spanish treasure ships, and on 21 January 1805 Thomas Davies was court-martialled for looting valuables from one of these prize ships, the Santa Gertrude. For this he could have been hanged but given his youth received instead 200 lashes, was fined all pay and prize money, and was sentenced to one year in solitary confinement. 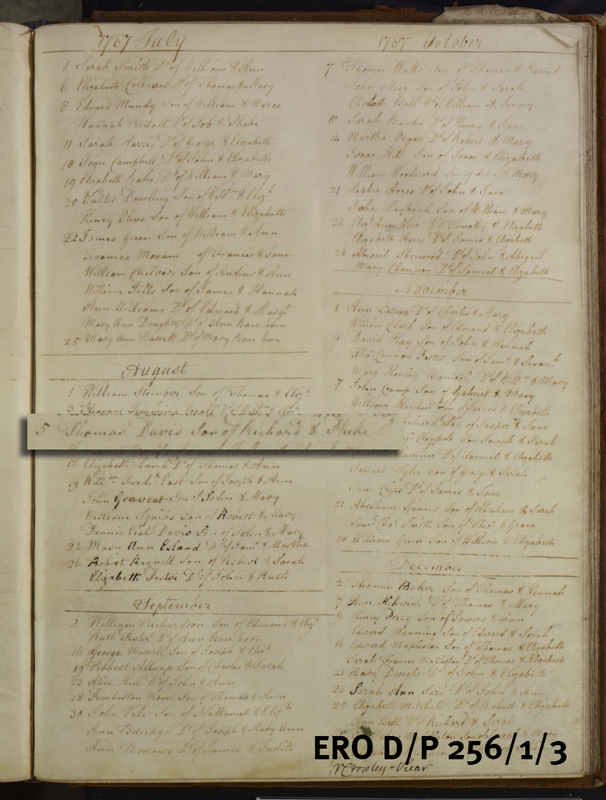 From the Marshalsea Naval Prisoners Entry Book (not held here) we know that that Thomas was ‘aged 18, a Seaman, about 5ft 5in high, brown complexion, light hair and eyes, rather slim and very youthful boy-like appearance, born at Stratford in Essex’. From this information given to us the Search Service found a very likely match in the baptism register for West Ham, All Saints Church for the baptism of ‘Thomas Davis son of Richard & Phebe’ on August 5, 1787. If you would like to search a document in our collections but are not able to visit in person, the Search Service may be able to help. Just let us know which documents you would like us to search in and for what information and we will send you the results. More information, including charges, can be obtained by e-mailing ero.searchservice@essex.gov.uk or by telephoning 01245 244644. Please note that we can only undertake specific and not general searches. This entry was posted in Archives, Collections, Family history and tagged baptism, family history, genealogy, naval, parish registers, Search Service by admin. Bookmark the permalink.